1. Determine whether egg consumption decreased due to the news of the Salmonella outbreak. 2. Determine whether consumers are substituting away from conventional eggs towards other types of eggs (organic, cage free, free range) or egg substitutes. 3. Determine how long this substitution effect (if any) lasts. 4. Examine whether there are any heterogeneous effects based on income and demographics. We examine how consumers in California reacted to three consecutive egg recalls during the 2010 Salmonella outbreak. Eggs infected with Salmonella were recalled through codes clearly labeled in egg boxes, leaving no infected eggs in stores. Using a large product-level scanner data set from a national grocery chain, we test whether consumers reduced egg purchases. Using a difference-in-difference approach, we find a 9 percent reduction in egg sales in California following the three egg recalls. Given an overall price elasticity for eggs in U.S. households of -0.1, this sales reduction is comparable to an almost 100% increase in price. We find no evidence of substitution toward other “greener" type of eggs, such as organic or cage free eggs. We also find no correlation with demographics such as income, but we do find that areas that had a larger than average household size decreased egg purchases more. We also find differentiated effects among Northern and Southern Californian stores. Although the national grocery chain had infected eggs only in Northern California, we find that Southern Californian stores had lower egg sales as well. The sales reduction in Southern California was half as large as the reduction in Northern California, and is consistent with media and reputation effects being significant determinants of demand, even in the absence of an actual food infection occurring in a region. such as home prices, new constructions, and census level information on renting vs. ownership. 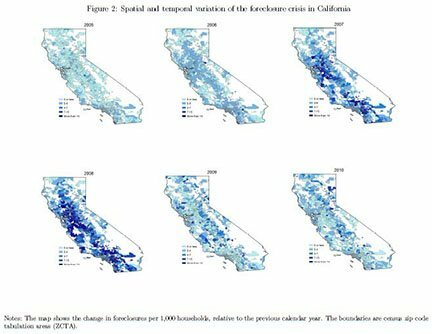 We collected and analyzed a detailed foreclosure data-set from the RAND corporation, that includes the number of foreclosed properties by house type for each month from 2002-2012 across all zip codes in California, in order to investigate the spatial and time series variation in foreclosures in California. We use both foreclosures of single-family and multi-family residences including condominiums, townhouses, and owned apartments. Importantly, a foreclosure is recorded in the data only when the proceedings are completed and the home is actually recaptured by the lender. Thus, the data do not include homes where foreclosure filings were initiated but the process was not completed because the borrower caught up with mortgage payments. We rescale the number of foreclosures by the number of housing units in the zip code, as measured by the 2010 census of population and housing. In all of our analysis we therefore measures foreclosures as the total number of foreclosures per 1,000 housing units in the zip code. 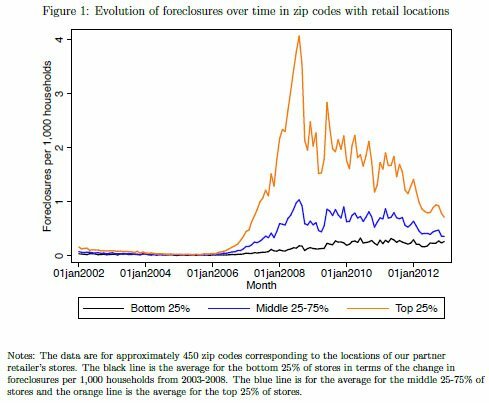 Figure 1 shows the evolution of foreclosures over time and relate those waves to the location of a large representative retail chain in California that will be used in future studies that combine the foreclosure to the retail scanner data. The foreclosure crisis picked up speed in 2007, but there is clear variation across locations in terms of the intensity of the crisis. Monthly foreclosures per 1,000 households peaked at around 4 in early 2008 in zip codes that were most severely impacted, or the orange line in the graph. In contrast, areas that were less affected by the crisis had similar levels of foreclosures up until 2007 but did not experience such large shocks during the height of the crisis. Most importantly, there is a notable amount of variation across space in the intensity of the foreclosure crisis. We demonstrate the spatial and temporal variation in foreclosures across zip codes in a map in Figure 2. The map shows the change in the number of foreclosures per 1,000 households in each zip code from 2005-2010. As is well known, the California foreclosure crisis clearly began in some areas in 2007, while in many areas the largest year-on-year increases in foreclosures took place in 2008. In many zip codes the change in foreclosures from 2007-2008 represents more than 1.5% of households (the darkest blue areas in the map). While there is substantial variation across zip codes, the California counties of Kern, Riverside, San Bernardino, and San Joaquin were heavily impacted. These constructed data exhibits promising variation to be used in future studies that combine foreclosure data to consumer level changes in expenditures for grocery items. In particular, future work uses this variation by comparing changes over time in areas that were heavily affected by the foreclosure crisis with changes in areas that were less affected. We will also combine these foreclosure data with tax records at the county level for a variety of taxable product categories, ranging from automobile, new and used, to clothes items to investigate the impact of the income shocks due to foreclosures on the allocation of consumer expenditures across categories. Conservation organizations seeking to reduce over-fishing and promote better fishing practices have increasingly turned to market-based mechanisms such as environmental sustainability labels (eco-labels) in order to shift patterns of household consumption. The real-world evidence-increasing per capita seafood consumption and continued decline in the size of some of the very fisheries that have been certified–suggests that these mechanisms may be falling catastrophically short of their objectives. This Giannini-funded project explores this apparent paradox with an empirical analysis of consumer response to an advisory for sustainable sea food adopted by a supermarket in the United States. The advisory consisted of a label in which one of the three "traffic light" colors was placed on the pin tag of every fresh seafood product to inform consumers about the relative environmental sustainabil ity of that product. Analogous to the food labeling system currently being proposed in the European Union, green meant "best" choice, yellow meant "proceed with caution", and red meant "worst choice." Using a unique product-level panel scanner data set of weekly sales data, we apply a difference-in-differences identification strategy to estimate the effect of the advisory on seafood sales. We find some evidence that the advisory led to a slight decline in overall seafood sales (significant -15.5%). We find strong evidence that the sale of yellow-labeled seafood significantly decreased (-31.3 to -34.9%, significantly). We fail to reject the null hypothesis of no change for green and red sales. Furthermore, yellow products on a mercury safe list had the largest drop in sales (-41.3%). These results suggest that we need a much better understanding of whether and when eco-labels achieve their goals before continuing to make large investments in household consumers as a primary conservation tool. Co-author: Dr. Eric Hallstein. The paper is under revision at the Journal of Environmental Economics and Management, second round. This Giannini funded project investigates whether information costs prevent consumers from making healthier food choices under currently regulated nutritional labels in a market-level expe riment. Implemented nutritional shelf labels reduce information costs by either repeating information available on the Nutritional Facts Panel, or providing information in a new format. We analyze microwave popcorn purchases using weekly store-level scanner data from both treatment and control stores in a difference-in-differences and synthetic control method approach. Our results suggest that information costs affect consumer purchase decisions. In particular, no trans fat labels significantly increase sales, even though this information is already available on the package. Low calorie labels significantly increase sales, while correlated low fat labels significantly decrease sales, suggesting that labeling response may also be influenced by consumers' tast e perceptions. Finally, combining multiple claims in a single label reduces the effectiveness of the implemented labels. Our results provide direct implications for changes to the format and content of nutritional labeling currently considered by the Food and Drug Administration. Co author is Professor Kristin Kiesel. The paper has been published in the International Journal of Industrial Organization. There exists a large literature that analyzes the impact of expert opinion on consumer choice and demand for experience goods. Due to the non-experimental nature of most prior studies, endogeneity is a concern. Specifically, there is likely a spurious correlation between good reviews and high product demand that exists because of an underlying correlation with unobservable quality signals. This paper avoids such obstacles through an experiment approach. Specifically, this study examines the impact of expert opinion on retail wine purchases. Anecdotal evidence suggests that consumers are largely uninformed regarding the quality of wine products: thus, wine is an experience good. There exist many sources of expert opinion for wine, including Wine Spectator and the Wine Advocate, which have reviews for more than 300,000 wines. However, little is known regarding the impact of such expert reviews. We find that while demand decreases for wines that receive low scores, demand for average- and higher-than-average-scored wines increases. The results indicate that expert opinion labels transmit quality information that affects demand as opposed to solely increasing the wine's shelf visibility to the consumer. These results have important implications for understanding how to effectively market wine and other consumer products reach and influence consumer behavior. Specifically, our results demonstrate that expert opinion labels can substantially increase wine sales. More broadly, for products where consumers' product knowledge is incomplete, the display of quality information may induce consumers to enter the market or to purchase such products on a more regular basis.